BIGGIE, INC. Home Attachments Warranty Contact Us! 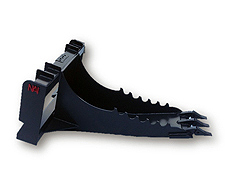 NAI's Extreme Stump Bucket is a superb attachment for tough digging in small areas like around stumps and rocks. These buckets are made from A-36 steel and feathers a 1 inch cutting edge with pin on teeth. It is designed with a long curved bottom to allow maximum prying power.